The Dirt cake recipe is a any of several popular American cake recipes that use sandwich cookies, pudding, whipped cream and other ingredients to create dessert cakes that look like big piles of dirt. The dish is most commonly made in a sterilized terra cotta flower pot from the hardware store, and is served to guests with a small plastic shovel. 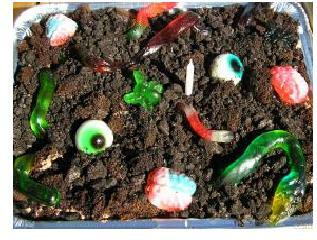 The standard form of this simple-yet-clever dirt-dessert is made by spreading a layer of crushed Oreo cookies on top of chocolate pudding, and adding gummy candy worms on top. Variations include adding vanilla wafers, vanilla pudding or fresh custard to the recipe. Use your imagination! Shown here is a traditional Dirt Cake recipe. Dirt Cake is especially popular at children's parties. Clean a new plastic rectangular flower pot and a new small plastic shovel or gardening spade. Crush the cookies in a zip lock bag with a rolling pin (or just squeeze the bag with your hands). Mix the cookie crumbs with melted butter or margarine. Spread a 2-inch layer of the mixture on the bottom of the flower pot. Combine the pudding and whipped topping, then spread it over the cookie crumb layer. Place Gummy Worms on top of the pudding layer. Spread the remaining cookie crumbs on top. Use chocolate chip cookies instead of Oreos. Add butterscotch chips or peanut butter chips to the recipe. Add raisins or Raisinettes to the recipe. They look like bugs! Add Macadamias or other nuts to represent rocks and stones. Decorate the cake with a little toy garbage truck, a tiny dirt bike, or maybe even some miniature farming equipment. Build a house of candy bar squares! White chocolate is most recommended for visual effect. Slide a flower stem through a drinking straw and stick it in the "dirt" so the whole thing looks like a potted plant. Serve the cake with a small gardening spade. To make more fantastically creative American recipes, click any of the links at the bottom of this page.